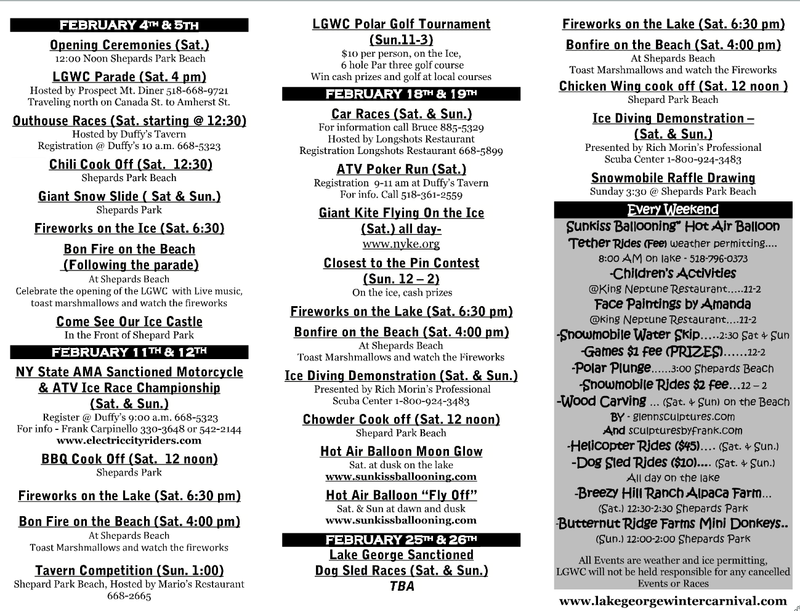 Lake George Winter Carnival Schedule of Events. 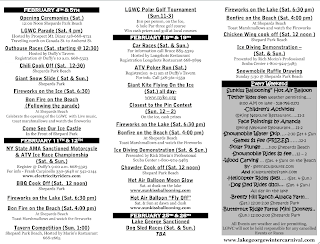 There is something to do every Weekend in February in Lake George! Below are some additional highlights from each weekend's events or click on the picture. Sat 4:00PM :: Lake George Winter Carnival Parade :: Travelling North on Canada St. to Amherst St. Sat 4:00PM :: Bon Fire on the Beach :: Shepards Beach -Toast marshmallows and watch the fireworks. Sat (All Day) :: ATV Poker Run :: Registration at 9-11 am at Duffy's Tavern. Sat 4:00PM :: Bon Fire on the Beach :: Shepards Park Beach. Toast marshmallows and watch the fireworks. Sat & Sun :: Car Races :: For information call Bruce (518) 885-5329. Hosted by and registration at Longshots Restaurant (518) 668-5899. Sat 4:00PM :: Bon Fire on the Beach :: Shepards Beach-Toast marshmallows and watch the fireworks.